Just like some mobiles manufactured by top companies, there is always the need to manufacture devices that different categories of users can afford. For this purpose, Hot 5 Lite was manufactured, as a lightweight version of Hot 5 to enable users feel the touch of the Hot 5 series and enjoy the features of built-in XOS Chameleon Android-based operating System. Built with a unique technology that focuses, mostly, on speed, performance, security and appearance, it gives users the bet for their money. It has two cameras with a flash. 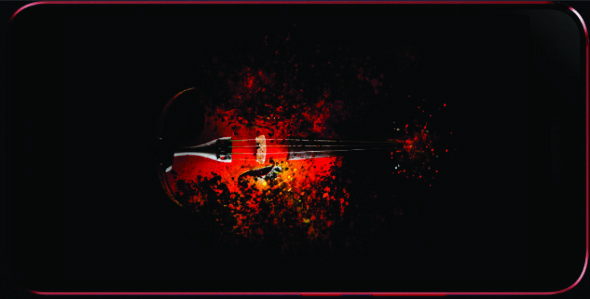 The design reveals slight curves at the edges with seemingly glittering effect to magnify the aesthetic appeal. The slim design and smaller height enable firm grip and operation with just a hand. This enhances the portability for which mobile phones are known. This mobile phone is available on popular online stores. If you intend to grab one from an online store, check the offers from Jumia and Konga. For mobile phones, power backup (battery) is considered a very important. How long the battery can last off a power source is a key factor. This mobile device has strong battery capacity as the rating proves. With a battery capacity of 4000mAh, it can deliver a talk time of 35 hours (nearly 1.5 days). For an average user, this can last for two days. When not in use, the battery can power your phone for a whopping 837 hours (that is over 34 days). Given the fact that the device operates on XOS platform that integrates efficient battery management features, you can be assured that your device will always be available for use even on long trips and in areas with fluctuating power supply. This mobile phone is built on the Infinix XOS Chameleon Android-based OS. This OS ensures efficient functioning and performance of your mobile device by activating relevant features that streamline unwanted operations by background applications. Its user interface is top of the class. The appearance features brighten your day and make it intriguing. There is magazine lockscreen that displays dynamic information when lockscreen is activated. In addition to this, you have the fingerprint sensor and XHide features to tighten security, XShare to easily share contents with friends at a faster speed and photo/video management functionalities. You can read more about the OS here. The storage capacity of this phone is considered a moderate one. It is however enough to store your contents. With a ROM (internal storage or internal memory) of 16GB, you have enough space to store your documents, videos, music, photos and other important files. It is also expandable to 32GB with an external micro SD Card. That is only necessary when you have used up the large memory space available The RAM size is 1GB, equally enough to speed the processing functions of your device. 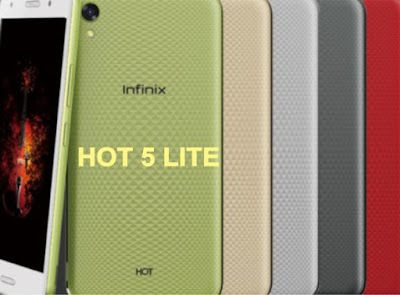 Hot 5 Lite comes with five colour variants of black, fine gold, white, lemon and red. It combines a rigid structure with colourful 3D texture to encapsulate youthfulness, beauty, and personalised aesthetics. This grants users the social confidence demanded from smartphones of this age. With a higher definition display of 5.5 inches and resolution of 1280 by 720 pixels, you have what it is needed to take your experience to another level. This display guarantees clearer, better, and brighter visuals. The design of the back reveals patterns of diagonally intersecting lines that form a beautiful mesh and appealing look. These patterns equally allow users to get firm grasps of the device with a single hand. For media pundits and lovers of music at extensively high volumes, the dual speakers added to the design of this phone will help you to enjoy high-quality video streaming and music. This technology creates room for dual audio cavities and makes them compatible with other components. Built on Dirac Stereo widening technology, the dual speakers produce a realistic stereo sound that is rarely seen in mobile phones. Infinix Hot 5 is a sleek mobile device that suits the needs of users from all levels. From graphics to internet connections, you have it all covered. You can check for available offers from Jumia.